demographic past. Over the past year, I have consolidated about 1.3 million aristocratic records that have been deposited online by the church of Jesus Christ of the Latter Day Saints. The LDS church believes in a doctrine called Baptism for the dead and they have amassed billions of genealogical records which they make freely available. My study, Longevity and the Rise of the West, uses those records which have estimates of birth and death dates, for those that die over 20, to construct a history of adult noble lifespan over the millennium between 800 and 1800. In doing this, there were many surprising patterns that emerged from the data concerning the path of violence, plague lethality and the characteristics of noble longevity across time and space. European nobility specialized in the execution of violence. Their genealogies connected them to the Barbarian conquerors of Europe following the decline of the Roman Empire. A large proportion of noble men died in battle. To investigate precisely how many nobles died from violence, I employed a general version of the famous birthday problem. First year statistics students are often introduced to probability via the surprisingly low number of people it takes to have a high probability of a shared birthday. If we take the number of exact-date deaths per year, n, and the number of deaths on a given day, m, we can calculate the probability that a given n-m combination occurs randomly or is likely the result of a battle. I use this ‘clumping’ technique to estimate the proportion of nobles dying from violence. My estimates are presented in figure 1 below. Violence suddenly declines within this warrior caste in the 16th century. The empirical challenge I faced was to extract from the imperfect, noisy data the major time and spatial trends in noble lifespan, while controlling for the changing selectivity and composition of the sample. Every possible covariate that could confound my characterization of the time-trends that could be included was included. Figure 2 below is my estimate for the time-path of noble median lifespan, 800-1800. 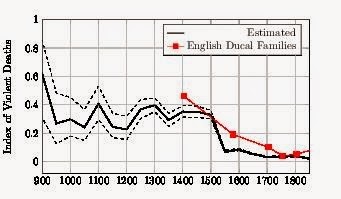 The results demonstrate that the nobility were forerunners of Europe’s mortality decline with significant and large increases in noble longevity beginning for the birth cohort of 1640-59 at least one century before that of the general population. However, a major surprise is the Europe wide rise in noble lifespan around 1400. From 600 years of mean of about 50, adult noble longevity rises sharply to a median of 55. This has never been documented previously. This pattern has remained hidden as only long and deep time series of at least a millennia in length could uncover this. 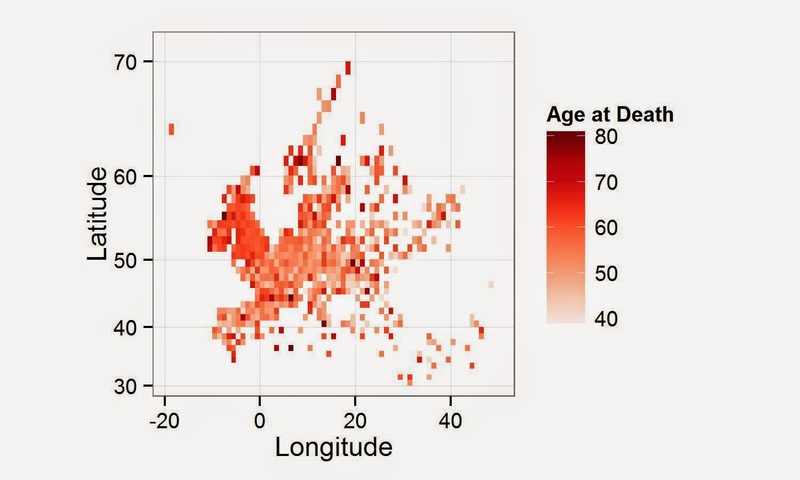 By coding each observation for longitude and latitude I was able to characterize the spatial aspects of noble mortality. Figure 3 reports median lifespan by integer values of longitude and latitude. There is a striking European Mortality Pattern. Nobles live significantly shorter lives in the South and East relative to the North and West. My analysis indicates that this Mortality pattern has existed since 1000AD. These results have implications for theories of the rise of Europe. The European Mortality Pattern revealed above correlates with those regions which later experience the Industrial Revolution first. Recent research has suggested that “The Great Divergence” of East and West is preceded by a little divergence of East and West, within Europe, around the time of the Black Death (1347). This research shows that North-West Europe was differentiated from the rest of the continent by its demographics centuries before the Black Death. 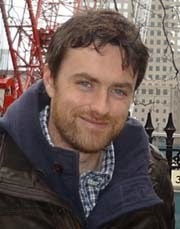 A new set of stylised facts has been uncovered that seem to raise more questions than they answer. Why were noble lifespans longer in Northwest Europe in 1000AD? What caused noble lifespan to shoot upwards in 1400? 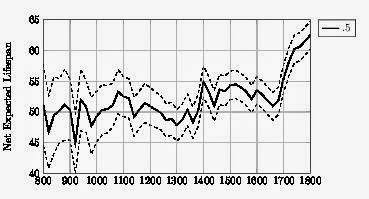 Why did violence decline so suddenly in the 16th century? Future research will tell us more.